TANZANIA is prepared to start processing 5,000 tonnes of cashew nuts per year at the Chinese Sunshine industry located in Mtwara Region. Speaking in Dar es Salaam yesterday the Minister for Industry, Trade and Investment, Mr Joseph Kakunda said the government and the management of the industry are progressing with discussion and soon the industry will start operations. He made the remarks in Dar es Salaam yesterday during the tour of the Chinese Ambassador in Tanzania, Ms Wang Ke to the Ministry of Industry, Trade and Investment for discussion on economic cooperation between the two countries. "We have agreed to strengthen economic cooperation between our countries and the major issue is Tanzania to start processing cashew nuts at the Sunshine Industry in Mtwara Region," he said. He noted, their discussion with the delegation of Chinese Ambassador to Tanzania based on the maintaining and strengthening economic cooperation between the two countries especially in the sectors of industrial technology and trade issues. 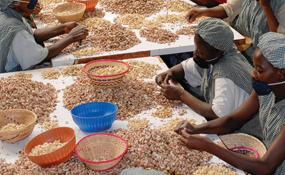 According to him, the industry will help Tanzania to export processed cashew nuts in the foreign markets. The Ambassador Wang Ke said China will continue to support Tanzania in the improvement of economic development especially in trade and industries sectors. She said over 200 Tanzanians would be benefited from job opportunities at the Sunshine industry. "We have a historical relation, we have to maintain it positively through supporting each other in improving economic development in our countries so I will make sure the industry starts operation soon," she said. She further said that China is planning to send a big delegation in Tanzania to explore investment opportunities. Meanwhile the Government of Japan also said will continue to improve and strengthen cordial relations with Tanzania especially in trade, industries and investments. Speaking at the offices of the Ministry of Industry, Trade and Investment in Dar es Salaam yesterday when he visited the Minister, the Japan Ambassador to Tanzania Mr Shinichi Goto said they will continue to support development of small industries through the Small Industries Development Organisation (SIDO).